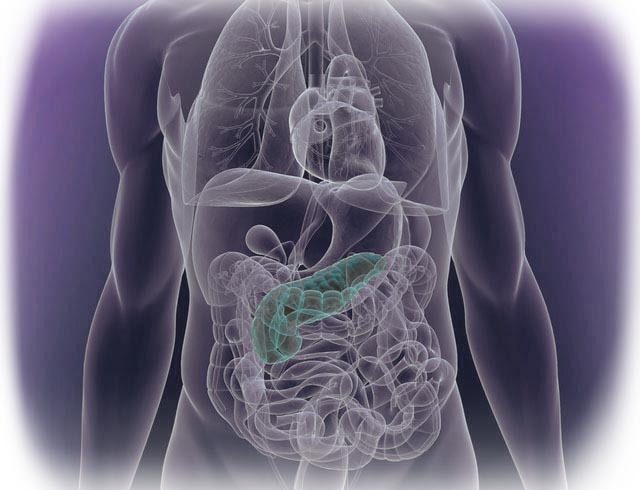 Pancreatic cancer occurs when damaged, or abnormal, cells grow out of control within the pancreas. Unfortunately pancreatic cancer is often diagnosed at an advanced stage, due to the location of the pancreas deep within the abdomen. The cancer can remain undetected until it grows large enough to affect or spread to nearby organs. Cancer is caused by changes in DNA (the genetic material that contains the instructions for all biochemical processes in the body), known as mutations. These mutations allow a cancer cell to replicate, bypassing the body’s normal control mechanisms which would usually repair or destroy the damaged cell. It is unclear how or why these mutations occur, although some people can inherit them whilst others gain them through environmental exposure. The number of mutations in cells also increases with age, which explains a higher susceptibility to cancer later in life. Pancreatic cancer commonly forms with the abnormal uncontrolled growth of cells in the pancreatic ducts, which then spread to the body of the pancreas. As the cancer grows and swells in size, it compresses vital structures adjacent to the pancreas. If the growth is within the head of the pancreas, this ultimately results in interference with bile release and causes obstructive jaundice. As they grow, the cancer cells destroy surrounding normal pancreas tissue, and infiltrate into nearby nerves, blood vessels and the lymphatic system, where they may travel to distant sites. Once a cancer has lodged in another organ, such as the liver or lungs, this is known as metastasis. ↑The picture above shows what pancreatic cancer looks like under a microscope (left) compared to normal pancreas (right). This is what a pathologist sees when he or she examines pancreatic tissue which is removed after surgery for pancreatic cancer.